Check out a great new video by JDov – a British-based Jewish organization that curates and produces TED-style talks from Jewish leaders and thinkers. Joseph Dweck’s talk, “The Names We Call Ourselves”, starts with a provocative question: If we, as a nation, as a collective body, were to look in the mirror and catch our own eyes, what would be the name we would identify with? What would we call ourselves? Rabbi Dweck, who is the Senior Rabbi at the Spanish and Portugese Sephardic Synagogue in the UK, offers an answer that seeks to encompass the whole of Jewish life, not just the religious part. He argues that our Jewish identity, culture and civilization is so broad and rich that we find ourselves having to “edit ourselves down” so that we can package it easily. But, in reality, we are a nation, a tribe with an enormously rich civilization to draw on. And Rabbi Dweck calls on us to embrace that richness. Check out the 15-minute video here to see what name he would want to use to refer to ourselves. Ask students to research their names, both their family name and first name. Where do the names come from? What history or tradition (if any) do their names connect them to? Combine this video with the activity “Who are the Jews?” or the text-study “Judaism as Civilization”. 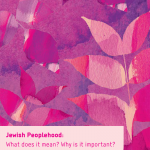 PreviousPrevious post:Peoplehood Papers 17: Engaging Millennials with Jewish PeoplehoodNextNext post:Get Ready for Purim!